Russian city founded in 1787 during the reign of Catherine II. ; capital of the government of the same name. It is one of the most important commercial and industrial centers of southern Russia, the census of 1897 crediting it with a population of 121,216 persons, including 36,600 Jews. The latter are actively identified with the trades and industries of the city, about one-third of the entire Jewish population (2,388 families; in all 11,157 persons) deriving its income from commercial pursuits, and another third (2,712 master artisans and 480 apprentices) being engaged in industrial occupations. The city has more than thirty shops and factories, mainly grist-mills, lumber-mills, foundries, machine-shops, and tobacco-factories. Almost all of these establishments are owned by Jews, but the number of Jewish factory employees is comparatively low, although in one cigarette-paper factory and in one tobacco-factory the workmen are all Jews. There are 847 Jewish day-laborers, mainly drivers, porters, etc. On account of its busy commercial and industrial life, Yekaterinoslaf serves as a center of attraction for the population of a very extensive region. 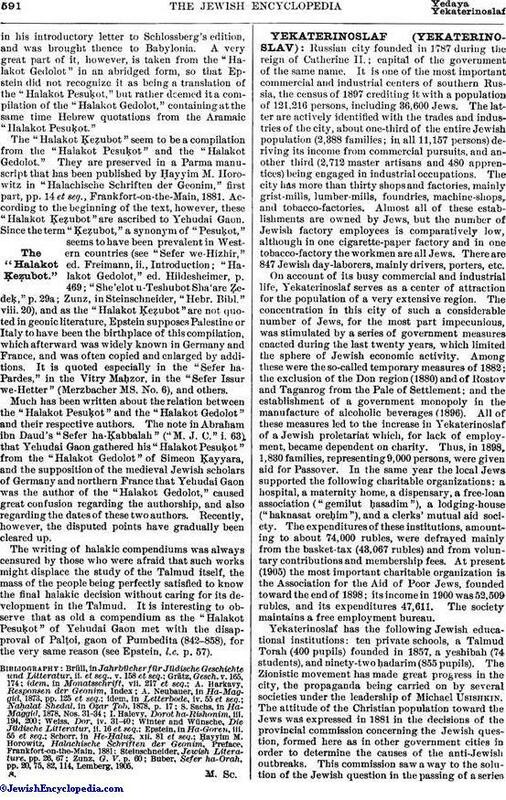 The concentration in this city of such a considerable number of Jews, for the most part impecunious, was stimulated by a series of government measures enacted during the last twenty years, which limited the sphere of Jewish economic activity. Among these were the so-called temporary measures of 1882; the exclusion of the Don region (1880) and of Rostov and Taganrog from the Pale of Settlement; and the establishment of a government monopoly in the manufacture of alcoholic beverages (1896). All of these measures led to the increase in Yekaterinoslaf of a Jewish proletariat which, for lack of employment, became dependent on charity. Thus, in 1898, 1,830 families, representing 9,000 persons, were given aid for Passover. In the same year the local Jews supported the following charitable organizations: a hospital, a maternity home, a dispensary, a free-loan association ("gemilut ḥasadim"), a lodging-house ("haknasat oreḥim"), and a clerks' mutual aid society. The expenditures of these institutions, amounting to about 74,000 rubles, were defrayed mainly from the basket-tax (43,067 rubles) and from voluntary contributions and membership fees. At present (1905) the most important charitable organization is the Association for the Aid of Poor Jews, founded toward the end of 1898; its income in 1900 was 52,509 rubles, and its expenditures 47,611. The society maintains a free employment bureau. Yekaterinoslaf has the following Jewish educational institutions: ten private schools, a Talmud Torah (400 pupils) founded in 1857, a yeshibah (74 students), and ninety-two hadarim (855 pupils). The Zionistic movement has made great progress in the city, the propaganda being carried on by several societies under the leadership of Michael Usishkin. 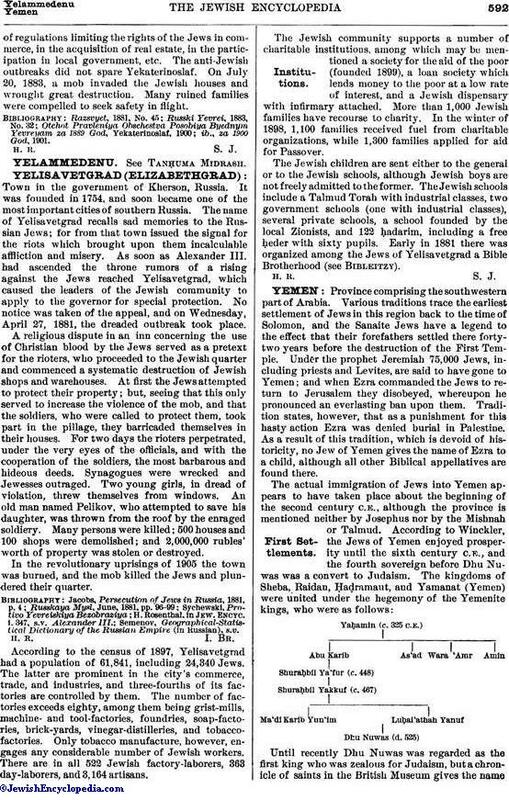 The attitude of the Christian population toward the Jews was expressed in 1881 in the decisions of the provincial commission concerning the Jewish question, formed here as in other government cities in order to determine the causes of the anti-Jewish outbreaks. This commission saw a way to the solution of the Jewish question in the passing of a seriesof regulations limiting the rights of the Jews in commerce, in the acquisition of real estate, in the participation in local government, etc. The anti-Jewish outbreaks did not spare Yekaterinoslaf. On July 20, 1883, a mob invaded the Jewish houses and wrought great destruction. Many ruined families were compelled to seek safety in flight. ib., za 1900 God, 1901.